Growing up once a year for my birthday my mom would buy a sheet cake from the Italian bakery. I would pretty much eat the entire sheet cake. I loved cake, and the Italian bakery sheet cake was delicious. My love affair with cake started with those birthday sheet cakes and only grew stronger once I started baking during my teen years. I would scour over cookbooks looking for new cake and cupcake recipes. Flash forward to a few years ago and my cake eating life was brought to a halt. I found out that I could no longer have gluten and I was devastated. Not only because I couldn't have pasta or bread, but because cake was taken away from me. I began trying various gluten free cake recipes using all purpose gluten free flour and pretty much hated all of them. Finally I came to the conclusion that I prefer straight flours, not store bought blends. Adding 10 different ingredients for one flour just isn't something that my taste buds seem to love. Now I try to use a variety of straight flours, some of which I have found I love and others I have never bought again. 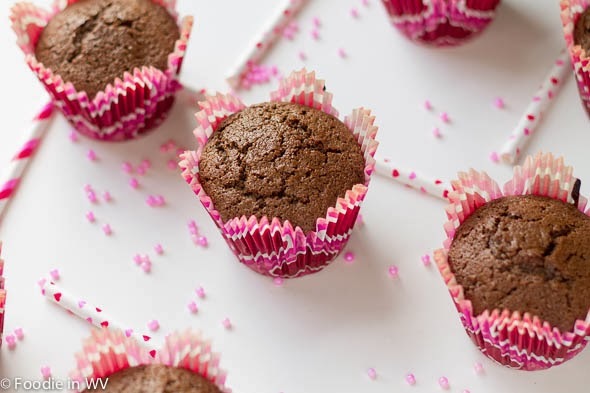 This week I tried a new recipe for Sour Cream Chocolate Cupcakes from the Bob's Red Mill site. This recipe has 11 ingredients. It takes 30 minutes of total time, 10 minutes of which is active and makes 12 cupcakes. I made a few changes to the original recipe. First I used muffin liners that I got on clearance after Valentine's Day. I love when I only have to pay a few cents for liners. Second, I found that my baking time was a little longer than the recipe, 25 minutes total. Make sure to watch the cupcakes closely, they will go from done to burnt very quickly. My kids loved these cupcakes. I was going to frost them, but my kids loved them plain. The fact that they ate the cupcakes without frosting says a lot since they are huge frosting fans. I was worried that the taste of the quinoa flour would be too strong, but they tasted chocolatey with no after taste. My husband thought that the quinoa flour tasted like peanut butter, which he really liked. 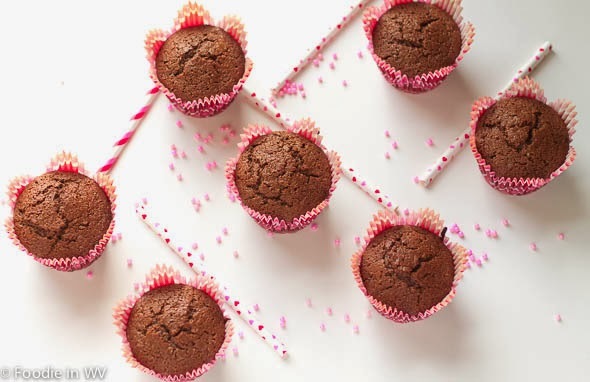 Overall, these cupcakes were very popular with my family and I would make them again. For the recipe go to Sour Cream Chocolate Cupcakes. Those liners look really nice and cute. Can be used not only on Valentine month. I am still learning to bake and these cupcakes look really delicious. Will definitely try this recipe. Have a great day! I don't love cake. If I Had my choice, I would probably pick ice cream or a peanut butter cookie over cake. And I only eat chocolate cake when I do -no vanilla or other flavors for me. This sounds like such an interesting recipe. I have baked with sour cream before but never tried quinoa flour. 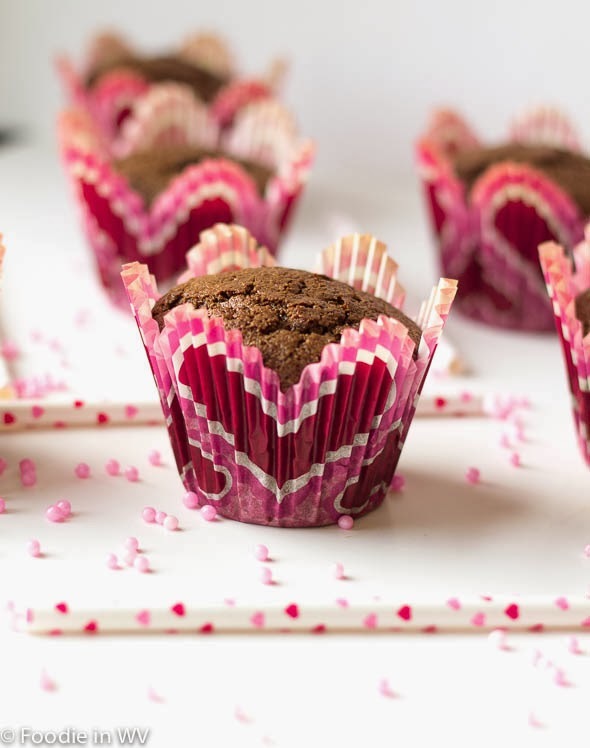 I love the use of sour cream and quinoa flour in these gorgeous muffins!